Two questions drove last week’s media coverage. 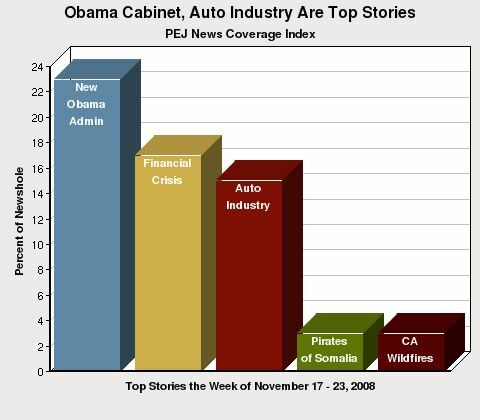 First, should the government offer a financial bailout to the hurting American auto industry? Second, what do the appointments to his cabinet say about how President-elect Obama will govern? Taken together, the country’s financial crisis, and the auto industry’s troubles in particular, amounted to the largest topic of media coverage for the week of Nov. 17-23. The transition plans for the new Obama administration followed, and together they accounted for more than half of the media’s attention last week. But while no other media stories came close to rivaling these major narratives, one new sensational storyline did emerge at the top of the media last week — Somali piracy. And two familiar plot lines returned to the media agenda, another dramatic round of California wildfires and a milestone agreement reached by the Iraqi government that garnered relatively little media coverage. These are among the findings of the News Coverage Index for Nov. 17-23, a weekly study of the media agenda from the Pew Research Center’s Project for Excellence in Journalism. The country’s ailing economy was the largest story in the news last week, filling 32% of the overall newshole. The financial crisis had two distinct but entangled components to the plot last week. First, the continuing fallout and follow-up to the government’s financial bailout of the private banking industry. Last week, that storyline filled 17% of the newshole. Second was the question of whether the auto industry should receive similar assistance, which filled another 15%. The banking bailout reemerged as a storyline in part because of hearings on Capitol Hill and the volatility of the stock market, which dropped more than 200 points for the week. That was fueled in part by troubles at Citigroup, one of the nation’s largest banks, and by comments from Treasury Secretary Henry Paulson while testifying on Capitol Hill with Federal Reserve Chairman Ben Bernanke. “For the auto industry to completely collapse would be a disaster in this kind of environment, not just for individual families but the repercussions across the economy would be dire,” said Obama. Much of the media narrative revolved around whether the government should bail out automakers, whose problems are not so closely tied to the current financial crisis and whose managers have failed to address long-term problems for years. Others were less nuanced. “No federal money for the car companies!” Bill O’Reilly began his show on Wednesday. He went on to blame the inflexibility of the labor unions for much of the car industry’s problems and asserted that supporters of the unions and the bailout, such as Rep. Barney Frank, were pushing a “socialist vision” that is wreaking havoc on the American economy. If the economy was the crisis of the moment, the transition to a new presidency was the context in which the events unfolded. Overall, the transition filled 23% of the media newshole, about the same amount as it had filled the previous week (24%). But if the story of the transition began with signals from Obama about the economic crisis, more of the week was dominated by leaks involving his possible appointments. There were even stories by the end of the week about how the leak-free Obama camp was now leaking. Friday afternoon featured multiple reports that the Obama transition team had decided on some key cabinet appointments not yet announced. More than half of the coverage relating to Obama’s transition was focused on his appointments and speculation as to what his appointments said about his governing style. Most notably were reports that seemingly ended the week-long speculation as to whether Obama’s Democratic rival for the nomination, Hillary Clinton, would accept the job as secretary of state. Prior to Friday’s news, there were few official announcements coming from the Obama team. Many suggested he had decided on a few posts, such as Eric Holder as attorney general, but since little had been formally announced, much of the news coverage revolved around rumors and speculation. In particular, many pundits debated what the rumored appointments would suggest about Obama’s governing style. Some critics suggested Obama was looking too much toward veterans from the Clinton administration and that by doing so he was not offering the change he had promised during the campaign. Eric Holder had been a top justice department aide during the Clinton administration. And of course former First Lady Hillary Clinton would be an even closer link. Another clear theme in the media narrative was the suggestion that Obama’s picks meant he wanted to surround himself with strong-minded individuals who did not agree with him on every issue. This, as Andrea Mitchell reported on Monday’s Today Show, was a lesson learned from reading about Abraham Lincoln who had reached out to his former rivals. Three of the top four newsmakers of the week, not including Obama, were tied to the president-elect. The speculation about whether Hillary Clinton would be named secretary of state made her the lead newsmaker in 3% of the stories for the week. Eric Holder, Obama’s pick for attorney general, was 2nd at 2%. Joe Lieberman, who faced retribution for supporting McCain but ultimately got to keep his committee chairmanship in the Senate, was 4th. 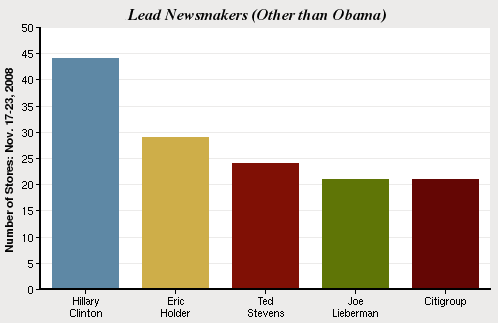 (Obama, who dominated all others, was the top newsmaker in 8% of all the stories last week). One other political figure also made big news last week, but he was the only major one who wasn’t connected to the new administration. The 3rd leading newsmaker was Republican Sen. Ted Stevens of Alaska, who officially lost his bid for reelection after the vote count was concluded on Nov. 19. Stevens had been a controversial figure because he had been convicted just a few weeks before the election of seven counts of failing to report gifts he received as an elected official. After the two major storylines of the week — the economy and the new Obama administration — no other topics garnered more than 3% of the week’s newshole. The No. 5 story of the week was the wildfires in southern California that burned 40,000 acres in about four days and destroyed hundreds of homes. It also filled 3% of the newshole. Stories No. 6 and 7 were both related to Congress. Story No. 6 was about the workings of the new 111th Congress which will come to session in January. Much of that coverage was focused on Sen. Joe Lieberman and whether he would keep his chairmanship of the Homeland Security Committee. The No. 7 story focused on the Congressional election results in the three states, Alaska, Minnesota, and Georgia, that were still in the process of being resolved. The No. 8 story of the week may be more memorable for how little noticed it was. On Sunday, Nov. 16, Iraq’s cabinet overwhelmingly approved a proposed security agreement that was negotiated with the United States and calls for a complete withdrawal of troops from Iraq by the end of 2011. The agreement led to violent protests in Iraq. There was a time, not that long ago, when the formal agreement to a deadline for U.S. withdrawal form Iraq might have conceivably dominated the American news agenda. No longer. Last week, driven by the security agreement for Iraq, events in Iraq was the No. 8 story of the week and filled 2% of the newshole. PEJ’s weekly News Coverage Index examines the news agenda of 48 different outlets from five sectors of the media: print, online, network TV, cable and radio. The weekly study, which includes some 1,300 stories, is designed to provide news consumers, journalists and researchers with hard data about what stories and topics the media are covering, the trajectories of that media narrative and differences among news platforms. The percentages are based on “newshole,” or the space devoted to each subject in print and online and time on radio and TV. In addition, these reports also include a rundown of the week’s leading newsmakers, a designation given to people or institutions who account for at least 50% of a given story.